–Iancu Tucarman, as told to Centropa. Iancu Tucarman was born in Iasi, Romania in 1922. He was 18 years old in June 1941, when German and Romanian soldiers, police officers and ordinary citizens began their pogrom in Iasi. 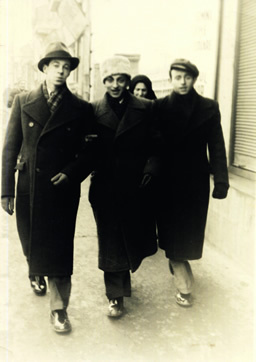 Iancu and his father were rounded up and brought to the police station, where 5,000 Jews were brought. Nearly half were shot or beaten to death at the police station. The Report of the International Commission on the Holocaust in Romania, from 2004, estimates that more than 13,000 Jews were killed in the Iasi Pogrom. Iancu on right next to friends Zuli Harabagiu and Lazar Copolovici, a victim of the Iasi death train. In the searing summer heat, the police forced Iancu into one of the infamous death trains to Podu Iloaiei. With the ventilation slats nailed shut, Iancu was one of the very few who did not succumb to heat exhaustion, suffocation, dehydration or suicide during the excruciating journey. “Because of the heat, most people remained naked. I also took off my coat and my shirt. Inside the car, some would go crazy and jump from side to side like at the circus. When there were only 10 or 12 of us left, the entire floor of the train car was covered with dead people. It was like a mattress they jumped on,” Iancu recalls. But Iancu’s ordeal was not yet over. He spent the rest of the war in forced labor, including five months at a labor camp in Podu Iloaiei. Iancu is now able to receive a pension from the Claims Conference’s Central and Eastern European Fund (CEEF). Negotiations with the German government led to recognition of previously unrecognized camps and work battalions in Romania and other places for purposes of eligibility for Claims Conference pensions. 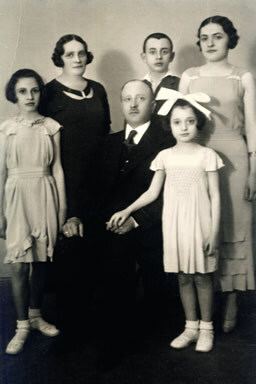 Parents Iosif and Minta with Fanny called Nutzy (on father’s left), Betty (first from right), Iancu behind his father) and Sofia (behind Fanny). “It was then that I entered the category of those who get this lifetime pensions which comes four times a year, every three months. I must say that this has significantly improved our life because I couldn’t have led a decent life only on the pension that I get for a 35-year work,” Iancu says. When the CEEF was established in 1998 to enable compensation payments to survivors of Nazi occupation living in the former Soviet bloc, its payment was half the amount of that of the Claims Conference’s Article 2 Fund, as the cost of living in the region was less than in the West. However, the Claims Conference pressed the German government for increased payments, especially as the cost of living rose in Eastern Europe. The Claims Conference has prevailed and payments gradually increased, as did those from Article 2. Two years ago, the Claims Conference succeeded in getting German government agreement that the payment amounts would be equal, with both pension programs currently paying €320 per month. Following the war, Iancu reunited with his father and three sisters, attended university and began a career in agricultural engineering. Now 93, widowed and living in Bucharest, he suffers from health problems such as heart disease and arthritis that would make independent living impossible without the homecare and medical assistance he receives from the the Federation of Jewish Communities in Romania, overseen by the Joint Distribution Committee and funded by the Claims Conference. In an interview with Centropa, which documents the stories of European Jews and survivors (and which receives funding from the Claims Conference), Iancu remembers the synagogues of his native Iasi and celebrating Rosh Hashanah with his family. We cannot bring back Iancu’s lost youth, but we can keep working to bring aid and comfort to him and the thousands like him who have endured the unimaginable.